This is our last visit to the Civil War tie-ins that I own. 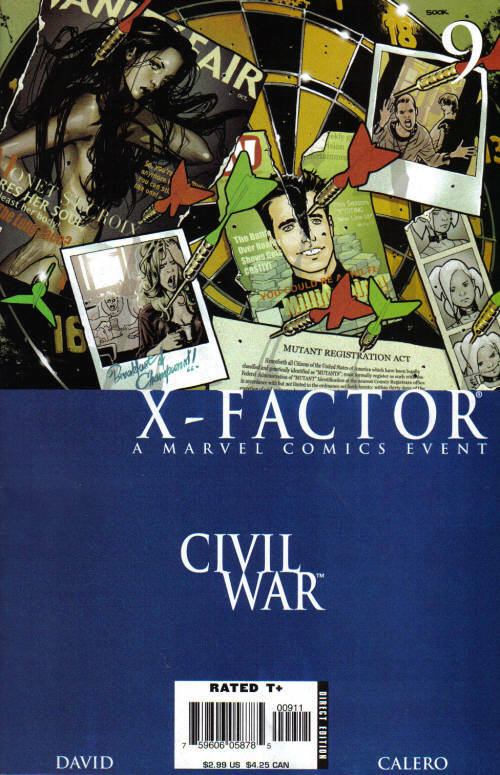 This is the only X-Factor issue I own of this volume, so lets learn about what has been happening for the past eleven years. The villain of the series, Singularity Investigations (a bad detective agency to counter X-Factor Investigations – the good detective agency) is still present. Madrox and Strong Guy have learn that Damian Trip,, the head of Singularity, shares the same DNA as his son. I like how everyone is astonished in this recap. A little tease of who may be appearing in this issue. Spider-Man has told Siryn that the X-Men and key Avengers know the secret of M-Day, and that news hasn’t made it to X-Factor, until now. Monet, Rictor and Wolfsbane has learn that a Madrox duplicate is not only a SHIELD member but also a registered hero. Layla (who is still a great character at this point) had a run in with Quicksilver but wasn’t that astonished as she saw it coming. The team is upset with Quicksilver as they know he was critical in the House of M event. He cost Rictor his powers, and countless others. Quicksilver tries to explain that his love for his sister, Wanda, and the Avengers were going to kill her. Strong Man grabs Quicksilver by the throat, I guess I also hadn’t thought about how Pietro was choosing one live over millions but he too didn’t know that was going to be the outcome. Quicksilver brags about how his new ability, thanks to the Inhumans’ Terrigen Mists, can give depowered mutants a version of their powers back. He threatens to try his powers on Strong Guy, as he doesn’t know what would happen if he touched a mutant who still has his powers. This makes Strong Guy put Quicksilver down. Quicksilver wants them to be united as they fight a common foe. Monet cites that the former population of Mutant Town would say that Pietro was the common enemy. Quicksilver likes Monet, she reminds him of himself in his younger days. Everyone turns to Madrox to get his opinion. Should they reveal the truth about M-Day, should they let Quicksilver join the team and should they register? He can’t take the pressures and leaves. Madrox walks down the steps and runs into Layla. She knew the truth about M-Day as she was the new character find of House of M. Madrox is upset as she is clearly holding information back, he threatens to do something to her. She questions if he is going to send her back to the orphanage, as a cab is coming up in a few minutes. This quiets him. There is three panels of quiet. Madrox isn’t good at making decisions, hence why he is a good team leader. Layla is there to provide some direction. She tells him to go North, and to buy a certain hat, gloves and a scarf – it’ll come in handy. She hints that they will be arguing for a long time, he asks what makes her say that. Because they will be married, eventually. Going in this direction, should give him some insight on the registration issue. Madrox is thinking about how Quicksilver’s plot is making him forget about Tryps. Is the son really the younger version of the father? Tryps is like time trips, right? Madrox thinks Tryps could be a clone, that is another option. This train of thought makes him think about how Spider-Man must be a clone, as he is everywhere. Madrox does eventually buy a hat, gloves and a scarf. Madrox runs into Aegis, who was a member of New Warriors, when I last read of him. Aegis is running as SHIELD is after him, as he isn’t going to register. Aegis is under the impression, that once you register, the government can make a super group of whichever needed heroes and send them on missions. Which is sort of what the Initiative does, but they stay in one state. Madrox is going to stick around with Aegis, as heroes should hang together. SHIELD stands down a street, waiting for Aegis. Little did they expect, a crowd of folks are storming down that same street. Naturally, it really is Madrox, times a hundred. Aegis is also dressed like how Madrox is, so he is able to sneak in the middle of the crowd. That’s who the extra set of clothes was for. Madrox offers Aegis a spot on X-Factor but he rather go through the sewers and hope to run into Captain America. Once alone, Madrox summons his dupes back to him. Once he has everyone, he gets dizzy and falls backwards down the subway tunnel that Aegis just went down. Quicksilver is trying to rent a storefront from a lady. Someone shouts that Pietro should come outside. 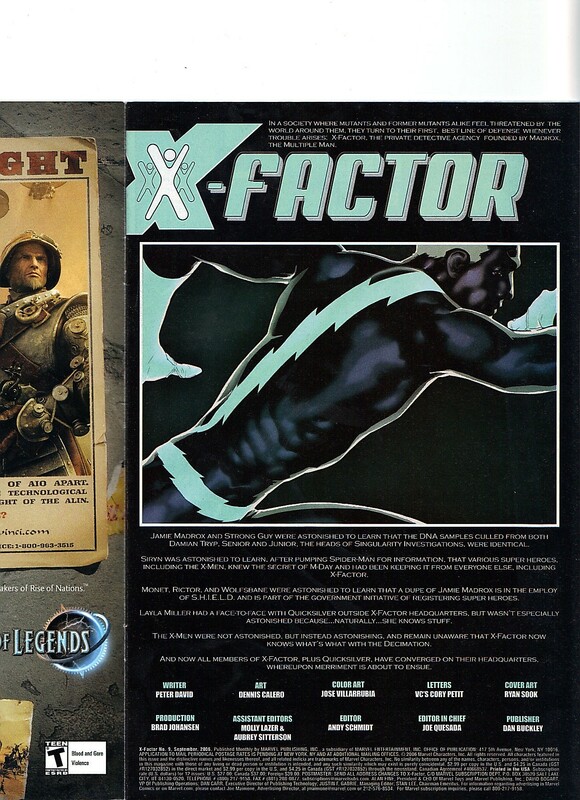 It is the Astonishing X-Men! Wolverine can smell Quicksilver but Kitty is quick to point out that only Wolverine can smell him. Calero does a great job of handling these legendary characters. Quicksilver tells the team that he is letting the lady exit stage left, so don’t harm her. Beast can’t believe the lady doesn’t know the X-Men are the good guys, in this scenario. Layla arrives, and Cyclops and Wolverine recognize her. Kitty should too, but she doesn’t get a moment with Layla. Layla mentions that X-Factor knows the truth about M-Day. Layla explains further about how she had parents in the House of M timeline but here, she doesn’t have parents. X-Factor arrives and Siryn speaks first. 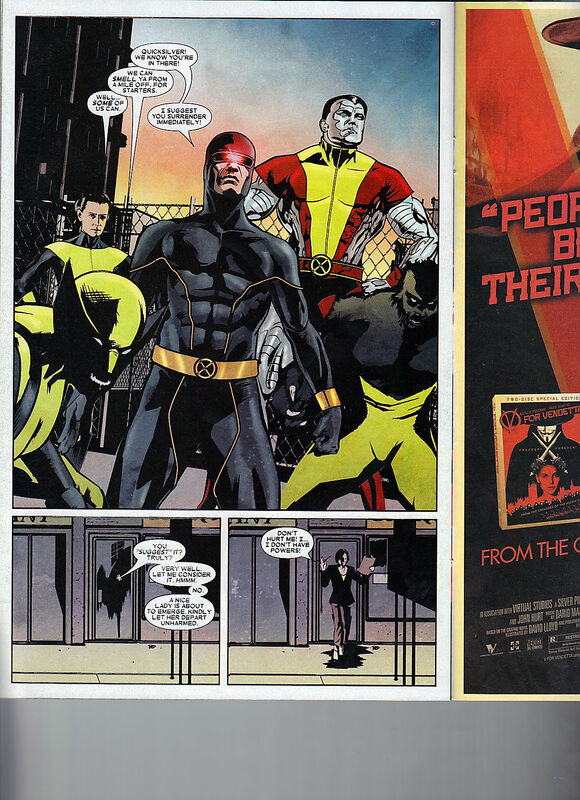 Cyclops’ team should have shown some respect for X-Factor by telling them that they were arriving. 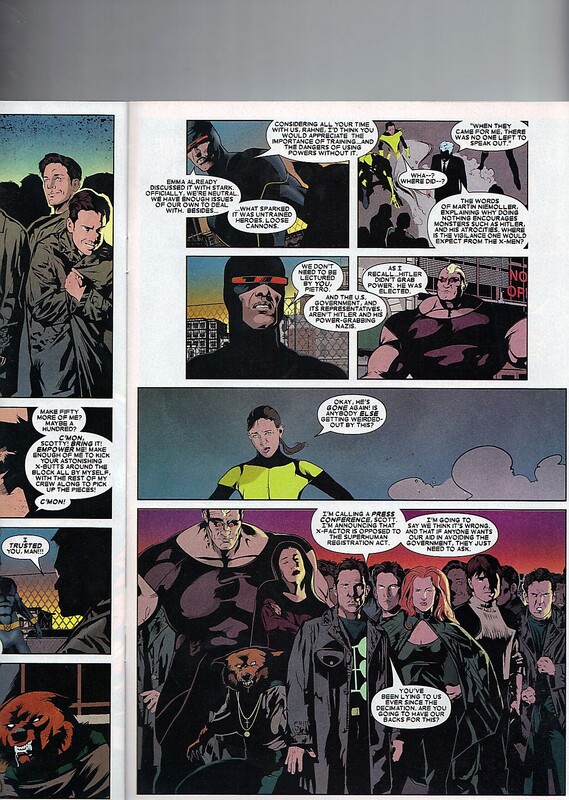 Rictor is the reason they are there, as he called them as he thought this was the only way to force the confrontation. X-Factor really doesn’t like that they were not informed about M-Day, I reckon it is because it makes them feel like a satellite team or a C-Team – which they were at this point, so removed from the X-Circle. Colossus begins to make a move but Siryn shuts him down. Cyclops blasts Madrox, which instantly creates ten of him. Madrox stands up to Cyclops, daring him to blast him a few more times. Scott tries to explain their reasons but Madrox points out that those reasons were already present, people will always fear and hate mutants. Cyclops tells them how Emma promised Stark that the X-Men are staying neutral during Civil War. Also, they don’t need to register, they don’t have secret identities and they work and live at a school, so training has never been an issue with the X-Men. Kitty doesn’t like that Quicksilver and enter and exit scenes,, as he pleases. Madrox is going to call a press conference and declare that X-Factor stands against registration. Since Cyclops won’t stand with Madrox, he tells them that they can get the heck out of Mutant Town. Cyclops tells his team that they are leaving. He also warns that once Quicksilver steps out of Mutant Town, the Astonishing X-Men will be back for him. Issue ends with Wolfsbane wondering if they won but Madrox isn’t sure. That’s it for our Civil War tie-in!